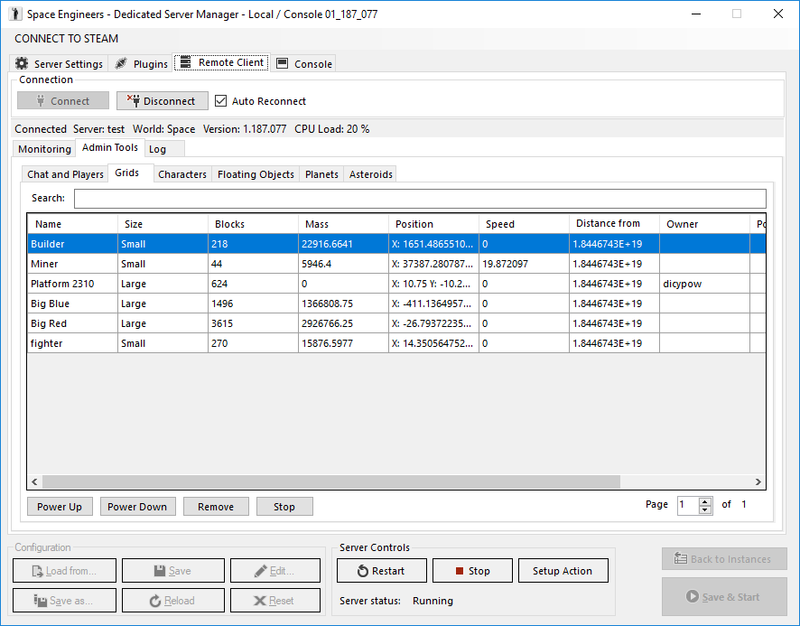 Dedicated servers in Space Engineers allow players to connect to a third party host, rather than using a player-host, in a peer-to-peer set-up. They are game instances intended for long time multiplayer games. They don’t depend on any player and they run without render and visual/audio effects. This will result to a faster connection and a more fluent multiplayer performance with less lag. Dedicated servers are available for everyone who owns Space Engineers. You don’t need an extra Steam account, you get Space Engineers dedicated servers for free with your existing Space Engineers account. Note: In order to run a dedicated server, server providers don't require a licensed copy of the game. However, to obtain the game server files, at least one Steam account needs to have a valid license. If you don't want to host a dedicated server yourself, you can rent one from our official hosts. Note: More improvements for the dedicated servers and more official hosts are coming within the next few weeks. 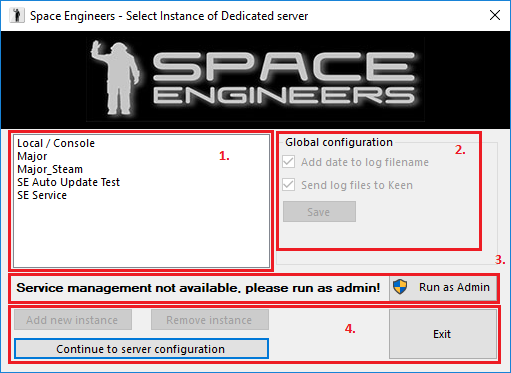 - Go to your Library/Tools, search for Space Engineers Dedicated Server and install that. Command line: "steamcmd.exe +login anonymous +force_install_dir somedirectorypath +app_update 298740 +quit"
-Here you can set variety of options. They work the same way as in the game. ​Here you can see the list of the server instances. There’s always one instance named “Local/Console” and optionally several other instances with custom names. 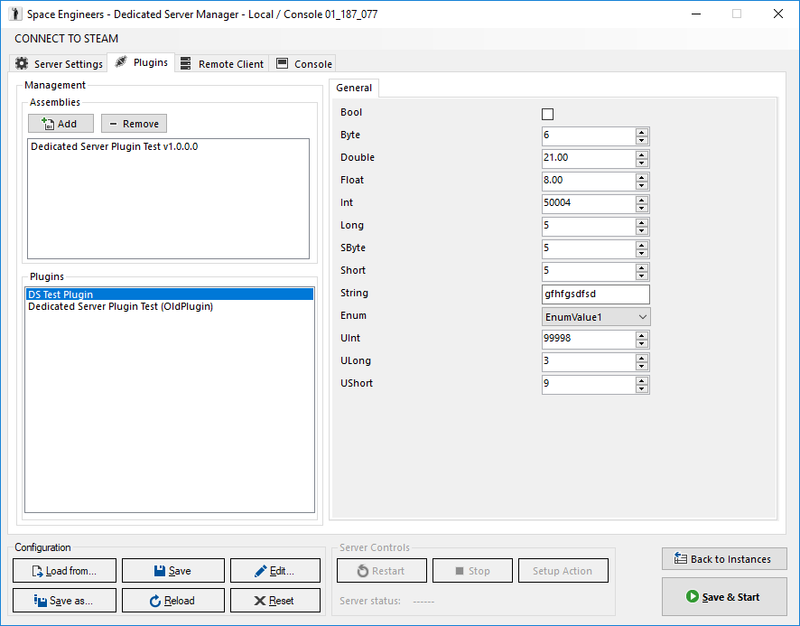 The “Local/Console” instance is run on foreground as a standard application and is always there, while the other instances that the user creates are run in the background as Windows services. 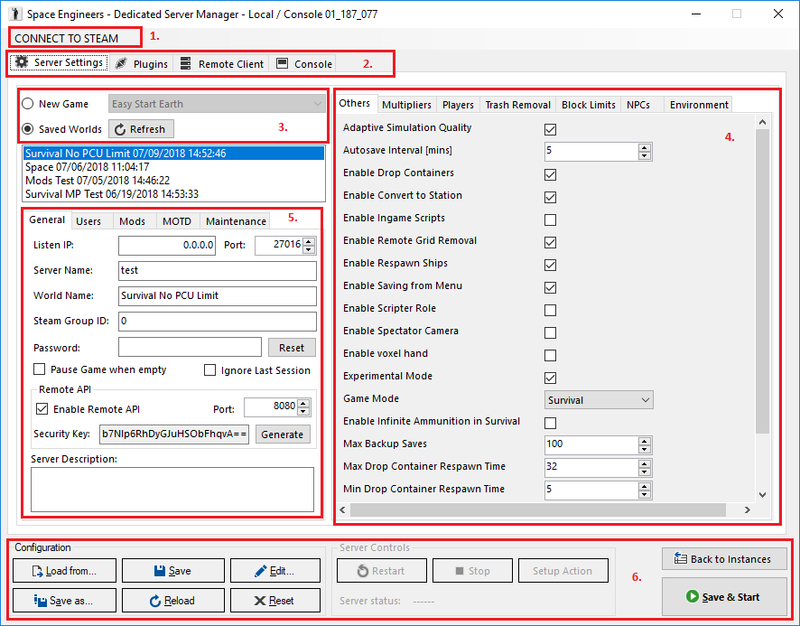 Here you can set, whether the game log files should have dates appended to them and whether the server should automatically send the log files to Keen Software House upon crash. ​This message is shown when the application is not run with administrator rights. If you want to create or manage the server as a service you need administrator rights. The button “Run as Admin” will restart the application with administrator rights. - Add new instance - Creates a new instance of the dedicated server as a Windows service. Some of the features of the UI are using Steam to help users to fill correct values. You can connect to Steam to get your friends and mods lists. To be able to use this you have to be logged into Steam on that machine. Scenario - Can only be chosen for the “New game” option. Other settings work as you know them from the game with the added bonus that you can set the numerical options to any value you want. You can select Admins, Banned and Reserved slots users on this tab. You can use your friends list or from history of the world. You can select Active Mods on this tab. You can use your Subscribed Mods list from Steam. You can fill Message of the Day and Message of the Day URL on this tab. This message will show up to every player, when connected to the server. You can use variables in the content of the MotD. Use the context menu of the text field to insert a variable of your choice. This variable will be replaced by actual value, when it shows to the player. You can setup Auto Restart and Auto Update features on this tab. Auto Update feature is supported only if the DS GUI is running. If you use DS GUI, then auto-restart is supported. If you don’t use DS GUI and start server as simple console application, then you have to make your own script. If you use DS GUI, then auto-restart is supported. You have to keep GUI open. If you don’t use DS GUI, then you have to go to properties of Windows Service (Control Panel/Administrative Tools/Services). Find service of the server and in the properties there is Recovery page. Set the First failure, Second failure and Subsequent failures to Restart the Service. Also make your own task in Task Scheduler, which checks if server is running. 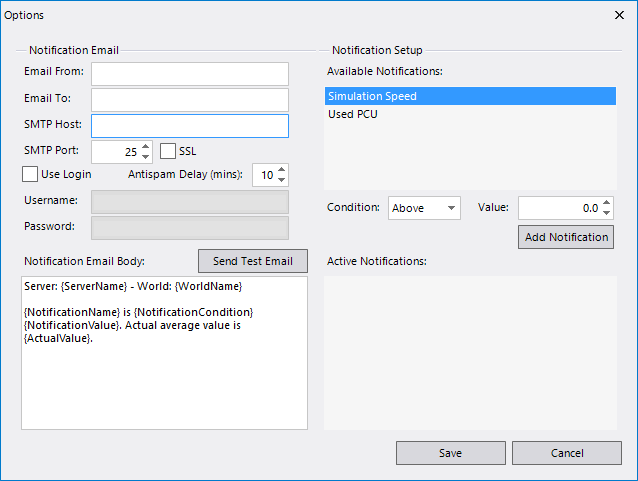 Setup Actions - this feature can Stop/Restart server with delay and chat message on the server. You can use plugins management for server side plugins setup. Add plugin assembly and then select plugin. 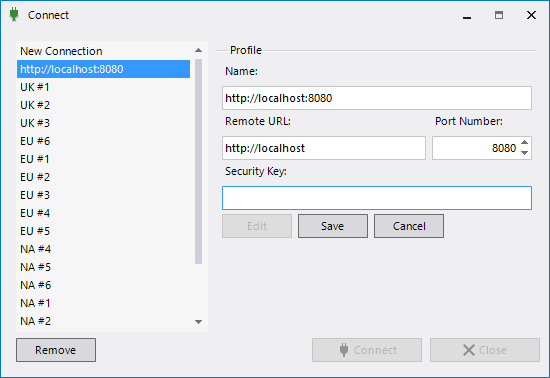 Remote Client helps you with the administering of your server without connecting to it. There is a monitoring tab with information about simulation speed and game play state. Admin tools tab is similar to Admin Screen (alt-F10). You can see global server chat, connected, banned or kicked players, list of all grids, characters, floating objects, planets and asteroids. There is standalone version of Remote Client in the Dedicated Server directory. You can start it by executing VRageRemoteClient.exe file. Standalone version has more features like Profiles or Notifications. This will stop the dedicated server correctly, saving the world etc. To stop it immediately add argument "/f", which will kill the server without asking to stop and without saving the world. To change data directory for dedicated server, mklink command may be used. a) Static IP: If you intend to run a game that people from all over the Internet can connect to, you will need a static public IP address. Your internet service provider should tell you whether you have one or not. Without the static IP address, you will be able to host a dedicated server on your LAN, but people from outside the LAN won’t be able to connect to it. b) Port forwarding: The game uses UDP protocol to communicate. The default listen port is 27016, but this can be changed in the config tool. In order for people to be able to reach your server, you will have to configure your router to forward all incoming UDP traffic on port 27016 (or any other that you have specified) to the computer where your dedicated server is running. c) Firewall settings: Make sure to set the firewall on your server computer to allow incoming UDP traffic on the listen port. 2) On the group's page (e.g. http://steamcommunity.com/groups/rps), click "Invite Friends"
If you want to make your own client you have to properly create a request. Remote API is using HMAC (HMACSHA1) to compute hash from specific data. HMAC is using private key. Don’t share this key with anyone. This is converted to byte buffer from UTF8 string and then used to compute hash. Hash is converted to Base64 string and added to header to Authorization field in format “nonce:hash”. ​With custom client you can get information about available resources on API URL (for example http://localhost:8080/vrageremote/api).